San Miguel de Allende is located in the state of Guanajuato and is one of the most beautiful colonial architectural jewels of Mexico. The city maintains its cobblestone streets and boasts a colorful atmosphere full of rich culture and traditions. 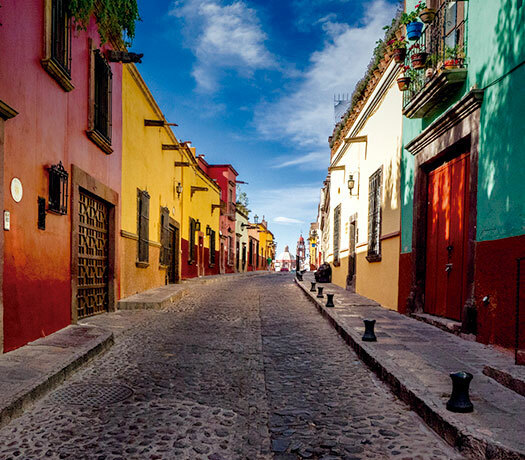 San Miguel is famous for its intense cultural and artistic way of life. Without a doubt, the main draw of this city is its architecture. Here you’ll see perfectly conserved buildings from the 18th century predominate, a fusion of different styles that gives the city its unique beauty. The Parish of Saint Michael the Archangel is the symbol of the city and retains its magnificent neoclassical interior decor. In San Miguel de Allende you’ll find comfortable hotels and exquisite cuisine, as well as a wide range of art galleries, thanks to the fact that numerous Mexican and foreign artists live in the city. Its romantic and bohemian atmosphere attracts thousands of people to the city to enjoy culture, arts, and the laid-back lifestyle. 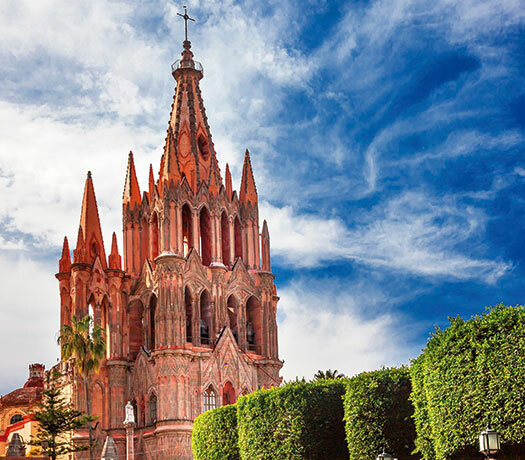 San Miguel de Allende is also home to a number of natural attractions, including thermal springs, a botanic garden and beautiful fresh water springs. Thanks to its location in a semi-desert like region, a temperate climate dominates in the city, making it ideal for a stroll through the cobbled streets, or for a relaxing coffee on the colonial terrace of one of the downtown restaurants. One of the top attractions in San Miguel de Allende is the "Sanmiguelada", one of the main social events in Mexico, attracting thousands of people from Mexico and other countries around the world. There are also the traditional "callejoneadas" (get-togethers in the streets that involve singing and dancing), which are very typical of Guanajuato state. Don’t pass up the chance to join in when you visit San Miguel! San Miguel de Allende stands out for its striking 18th century architecture and for its intense cultural and artistic way of life; this is complemented by a dazzling setting complete with beautiful mountains, valleys and trails. It is a city with a calendar packed full of traditions and festivals throughout the year, and is famous for its temperate climate and its hot springs. San Miguel de Allende has been declared a UNESCO World Heritage Site and is home to hotels that cater to all budgets, ranging from budget inns, to sophisticated boutique hotels with luxury services. One of the traditional "fiestas" of San Miguel de Allende is the Sanmiguelada, a term which comes from the iconic Spanish Bull Run in Pamplona. Every September, this event is draws more than 20,000 brave people from all over the country who gather in the downtown to face a dozen bulls. Here you can be close to the bulls and watch the entire spectacle safe behind a metal fence, or on T.V in a comfortably seat at a bar. You can wear a white t-shirt and a red bandana to blend in with what is traditionally worn by the participants. This is a colorful, picturesque and traditional spectacle that is very common in the state of Guanajuato, especially in San Miguel de Allende. Every Friday and Saturday, a group of happy-go-lucky students meet in the main plaza dressed in period costumes from 17th century Spain. The students form groups called "estudiantinas", which go around the streets doing serenades, singing songs about famous local legends. San Miguel de Allende has a cosmopolitan atmosphere thanks to an influx of people from all over the world who have come to live here over the years. The climate is warm all year round and, when combined with the hot springs and the beautiful architecture, has made San Miguel an attractive place for foreigners, leading to a large expat community largely of American or Canadian origin. Many have chosen to retire here, taking advantage of their free time and the tourist industry to start businesses, giving back to the community of San Miguel. Thanks to its great climate and welcoming people, along with its many cultural, traditional and social events, San Miguel de Allende has become a cosmopolitan city, ideal groups. It has modern tourist and hospitality facilities that are well-equipped to receive business groups looking to plan congresses, conventions and meetings somewhere unique and different. Queretaro is home to La Casona Convention Center, which has with capacity for up to 1,200 people, as well as large chain hotels with lots of event space. 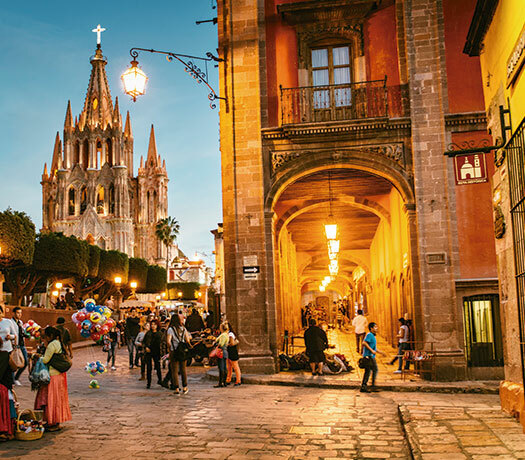 Even though it does not have its own airport, San Miguel de Allende is well connected to the hubs of Mexico through modern roads and highways. The nearest airports to Queretaro are the following: Intercontinental Airport of Queretaro (80 minutes), Bajio International Airport in Leon, Guanajuato (90 minutes), and Mexico City International Airport (3 hours).